Successfully Added 802.11G High Power Wireless USB Adapter (RTL8187 Chipset) to your Shopping Cart. 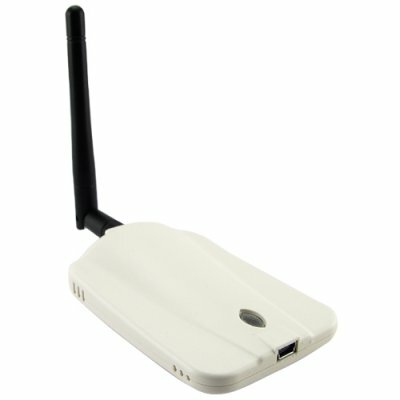 High Power Wireless USB Adapter for accessing wireless networks with fast IEEE 802.11G connection. Most powerful USB dongle type external WiFi adapter on the market today with its 500mW of power and threaded (RP-SMA) Antenna Jack for true high gain performance. For maximum speed and maximum range you cannot find anything better than this hot high gain wireless adapter with professional chipset. With an angle adjustable external antenna and simple setup you'll be surfing wirelessly in no time. Get rid of all that ugly networking cable from your office, lounge and bedroom by installing one of these awesome high power, high gain wireless USB adapters with the advanced RTL8187 chip set. Suitable for both Ad Hoc (computer to computer) and Infrastructure (through a router) networks and capable of all compliant data rates up to and including 54 Mbps 802.11g standard. In addition, the powerful Realtek RTL8187 Wireless LAN Utility software will allow you to configure and tweak your connection for maximum efficiency. A great addition for both notebook and desktop computers. In stock and available for single or bulk quantity orders, get yours today at the usual Chinavasion low wholesale price and with no M.O.Q. (no minimum order quantity) from the original direct from China electronics wholesaler, Chinavasion Electronics. Wireless USB Adapter with Realtek chipset. 802.11G connection at up to 54 MBPS. Powerful omni-directional (+2.5 dBi) 4 inch folding antenna. More power = longer range!